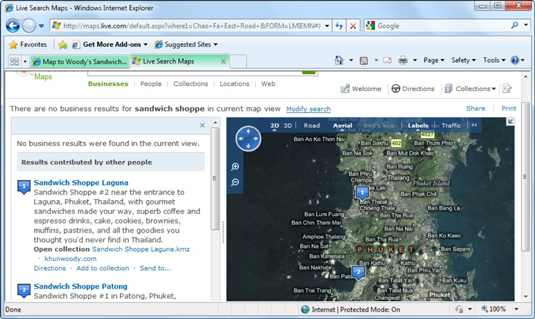 Internet Explorer 8 introduces a new feature called Accelerators in Windows 7. You can use Accelerators in Internet Explorer 8 to take data from a Web page and run with it using a series of right-click menu options that bypass the traditional process of copying data, pasting it in a search engine and then finding the new page process. For example, you can highlight an address on a Web page, right-click it, and choose Map with Live Search. With very little effort, you’ll soon see a map of the location, complete with offers for driving instructions and traffic reports. Rather than copy and paste an address into, say, Google Earth, in IE 8 you can simply highlight an address, right-click it, and look it up in Live Search Maps. Translate languages: Highlight a phrase and choose either Live Search Translator or Google Translate to generate a translation of the phrase. You can switch From and To languages by clicking a link. Lookup reference material: Read dictionaries, Wikipedia, and other references (such as music and movie site lookups). Read the news: Highlight a word and search for it in news and sports headlines. Experiment with torrents and file sharing services, videos (such as YouTube), and live TV. Shop at sites such as eBay and Newegg. Study your financial information, currency converters, stocks, and charts. If you aren’t yet using Accelerators, give them a try: they’re positively addictive. To work with Accelerators, choose Page→All Accelerators→Manage Accelerators. Want more options? Click Find More Accelerators.